'This Town Ain't Big Enough for Both of Us' is easily the best known song by this quirky art-pop group led by the eccentric Mael brothers from Los Angeles. I don't know if it can be described as prog, at least in the usual sense, but it makes most music of their British contemporaries QUEEN sound lame in comparison, and a lot of 10CC as well. In some way they sounded like being many years ahead of their time. This fast, frenzy, highly strung song with theatrically high vocals is like a turkish pepper: it leaves no one cold but doesn't necessarily make you want more. An interesting detail about the writing of this song is that originally it was thought to include (for the chorus) various clichés familiar from B movies, but "this town ain't big enough for both of us" won the honour alone. 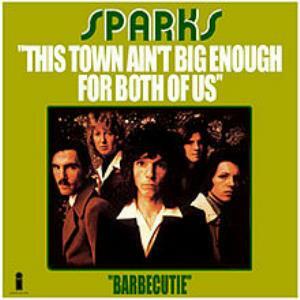 'Barbecutie' on the single's B side is an average Sparks song, reminding a little of the early ROXY MUSIC (e.g. 'Virginia Plain') but is more straight forward [glam] rock. Nothing I would want to hear many times. I must say Sparks have never been among my listenings. When I was a child the album covers of Kimono My House and especially Propaganda (with the tied couple seated on a boat) made a strong impression on me, and 'This Town...' still sounds powerful and unique whenever I happen to hear it. Once I borrowed a compilation of this band but I didn't much like the music in general. So if there's a band that I want to remember by just one particular song, it's this one.